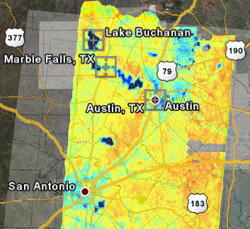 On July 3, a NASA aircraft equipped with a state-of-the-art sensor provided emergency response officials with critical soil moisture data for several regions across Texas that were threatened by flooding. NASA responded to the heavy rains and flooding in Texas by redirecting a NASA research aircraft, the P-3B, to Texas after it completed an interagency project in Oklahoma. The aircraft had been flying a sensor developed by the University of Colorado at Boulder, NOAA and U.S. Department of Agriculture that could provide detailed maps of ground surface water. At the request of researchers at the University of Colorado’s Center for Environmental Technology, which built the sensor, NASA detoured the plane to Texas to help emergency response teams there better track the areas subject to flash flooding. On June 13, a low-pressure weather system entered Texas from the Rocky Mountains and persisted until July 7, triggering storms across the state that flooded every major river basin. The state received more than three times the average rainfall for the period. Nearly two dozen people were killed in the flooding. At one point during the crisis, officials measured 19 inches of rainfall in just 24 hours. Eight inches of rain fell in one hour over Marble Falls, a town 70 miles west of Austin. During the first week of July, Texas officials accepted an offer from the University of Colorado and NASA to fly the sensor over a large area. During the day-long mission, the Polarimetric Scanning Radiometer, an airborne remote-sensing system, enabled researchers to quickly create soil moisture maps identifying areas where additional rainfall could lead to flooding. "During the floods, the instrument aboard NASA's P-3B aircraft flew over areas where the greatest rainfall had been forecast and informed us of the degree of saturation of the soil in urban and rural locations at a time when we had no other means of making those judgments for such a broad area," said Gordon Wells, program manager at the Center for Space Research at the University of Texas, Austin. "The data enabled the state to stage Coast Guard and Department of Public Safety helicopters in those areas to stand by for search-and-rescue should it have been necessary." "We're always concerned about when and where the next flooding conditions may occur, especially if it may affect major metropolitan areas like Austin or San Antonio, or a remote, hard-to-access rural area where only air evacuation may be possible," said Wells. Wells works with state officials regularly in search-and-rescue emergencies, overseeing field teams that must decide what resources to deploy – including several hundred boats and several aircraft – depending on the nature and extent of the crisis. According to Wells, NASA's P-3B and the onboard sensor contributed to officials' full awareness of the flood situation, and became an extra tool they used to make decisions. "It's important to pre-plan how to prevent casualties and injuries. So the more we know and the sooner we know it, the more casualties can be avoided," said Wells. State officials typically would have relied on reports of flooding on roads and highways to help them predict the likelihood of future flooding in the affected areas, as well as imaging radar data to identify the location of pooled water and the level of reservoirs. "The first-cut data product sent to Wells' team from the P-3B provided them with images of precise, geographically identifiable points of concern for flooding," said Al Gasiewski, principal investigator for the sensor at the University of Colorado and director of the school’s Center for Environmental Technology. “Our team has worked with NASA over several years to develop airborne microwave mapping technology. We’re pleased to see it used for humanitarian purposes.” "From the Sabine River near the eastern Texas-Louisiana border to the Nueces River in the southwest, the Red River to the north and the Colorado River that cuts across the state, heavy rains these last few weeks unleashed some of the worst flash flooding this state has seen. We're very pleased and grateful that NASA and the university offered to assist with a mission that very well may have helped save lives," said Wells.